To-day is the Immaculate Conception of the Blessed Virgin Mary. And the Virgin's foot crushed the serpent's head. And indeed, illustrious documents of venerable antiquity, of both the Eastern and the Western Church, very forcibly testify that this doctrine of the Immaculate Conception of the most Blessed Virgin, which was daily more and more splendidly explained, stated and confirmed by the highest authority, teaching, zeal, knowledge, and wisdom of the Church, and which was disseminated among all peoples and nations of the Catholic world in a marvelous manner -- this doctrine always existed in the Church as a doctrine that has been received from our ancestors, and that has been stamped with the character of revealed doctrine. For the Church of Christ, watchful guardian that she is, and defender of the dogmas deposited with her, never changes anything, never diminishes anything, never adds anything to them; but with all diligence she treats the ancient documents faithfully and wisely; if they really are of ancient origin and if the faith of the Fathers has transmitted them, she strives to investigate and explain them in such a way that the ancient dogmas of heavenly doctrine will be made evident and clear, but will retain their full, integral, and proper nature, and will grown only within their own genus -- that is, within the same dogma, in the same sense and the same meaning. Hence, it is the clear and unanimous opinion of the Fathers that the most glorious Virgin, for whom "he who is mighty has done great things," was resplendent with such an abundance of heavenly gifts, with such a fullness of grace and with such innocence, that she is an unspeakable miracle of God -- indeed, the crown of all miracles and truly the Mother of God; that she approaches as near to God himself as is possible for a created being; and that she is above all men and angels in glory. 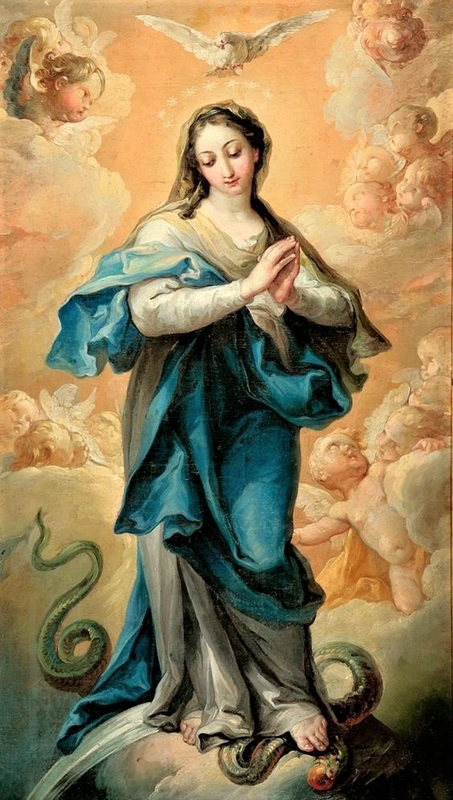 Hence, to demonstrate the original innocence and sanctity of the Mother of God, not only did they frequently compare her to Eve while yet a virgin, while yet innocence, while yet incorrupt, while not yet deceived by the deadly snares of the most treacherous serpent; but they have also exalted her above Even with a wonderful variety of expressions. Eve listened to the serpent with lamentable consequences; she fell from original innocence and became his slave. The most Blessed Virgin, on the contrary, ever increased her original gift, and not only never lent an ear to the serpent, but by divinely given power she utterly destroyed the force and dominion of the evil one. To these praises they have added very noble words. Speaking of the conception of the Virgin, they testified that nature yielded to grace and, unable to go on, stood trembling. The Virgin Mother of God would not be conceived by Anna before grace would bear its fruits; it was proper that she be conceived as the first-born, by whom "the first-born of every creature" would be conceived. They testified, too, that the flesh of the Virgin, although derived from Adam, did not contract the stains of Adam, and that on this account the most Blessed Virgin was the tabernacle created by God himself and formed by the Holy Spirit, truly a work in royal purple, adorned and woven with gold, which that new Beseleel made. They affirmed that the same Virgin is, and is deservedly, the first and especial work of God, escaping the fiery arrows of the evil one; that she is beautiful by nature and entirely free from all stain; that at her Immaculate Conception she came into the world all radiant like the dawn. For it was certainly not fitting that this vessel of election should be wounded by the common injuries, since she, differing so much from the others, had only nature in common with them, not sin. In fact, it was quite fitting that, as the Only-Begotten has a Father in heaven, whom the Seraphim extol as thrice holy, so he should have a Mother on earth who would never be without the splendor of holiness. Hence, if anyone shall dare -- which God forbid! -- to think otherwise than as has been defined by us, let him know and understand that he is condemned by his own judgment; that he has suffered shipwreck in the faith; that he has separated from the unity of the Church; and that, furthermore, by his own action he incurs the penalties established by law if he should dare to express in words or writing or by any other outward means the errors he think in his heart. Part II - The necessity for the Ark of the Covenant to be free from any stain. Thou art the glory of Jerusalem, thou art the joy of Israel, thou art the honour of our people.